An experimental attempt by Sri Lanka to induce artificial rain amid a prolonged drought fell short of expectations when the anticipated rain materialized a day late. Despite the setback, the government appears committed to exploring the technology further as it seeks to address power cuts caused by low water levels in its hydropower reservoirs. Scientists have called for comprehensive studies on cloud microphysics, meteorology and observational studies to ensure that such an expensive endeavor is backed by adequate scientific data. With no cost-benefit analysis, climatologists fear that artificial rainmaking may cause adverse impacts over the long term. A recent attempt to induce rain amid a prolonged drought in Sri Lanka has fallen short, but that hasn’t stopped the government from embracing the project, to the dismay of scientists who have urged greater studies into the technology and its long-term impacts. The drought conditions have brought soaring temperatures and regular power cuts in a country where about 8 percent of electricity comes from hydropower. These conditions have frayed the public mood, and the power crisis is expected to continue as water levels in the hydropower reservoirs remain low. To trigger rains in the catchment areas that feed the dams, the government recently carried out an rainmaking experiment. Though it recorded only marginal success, with the results now under review, the government is looking to adopt the technology as part of its long-term solutions, including creating a department for artificial rainmaking under the Ministry of Power and Energy. “We require more rain to meet the country’s hydropower requirement,” Sulakshana Jayawardena, spokesman for the Ministry of Power and Energy and Business Development, told Mongabay. He said Sri Lanka had experienced severe drought conditions in the past two years, with many catchment areas not receiving adequate rain to generate sufficient hydropower. Jayawardena said the reservoirs were only filled up to about 50 percent of their capacity. “We had to explore artificial rainmaking. The annual average rainfall of 2,000 mm [79 inches] is completely insufficient to meet the demand for power,” he said. Jayawardena said generating thermal power cost the state about 12 times as much as hydropower per unit of energy. As such, the government is likely to pursue more rainmaking exercises, he said. But the failed attempt at rainmaking has drawn criticism, with experts calling for scientific assessments before long-term programs are envisaged. Lareef Zubair, a climate scientist dubbed artificial rainmaking an “unproven technology,” and called for comprehensive research on cloud microphysics, meteorology and observational studies. “Let’s first take a holistic look at things,” he said. An expert committee that looked into the rainmaking initiative has called for a better monitoring system and catchment conservation, before making big decisions. Concerns have also been expressed abut poor management of rainfall, with experts saying that Sri Lanka has failed to make maximum use of rain received. Ranjith Punyawardene, principal climatologist at the Faculty of Agriculture at the University of Peradeniya has also called for a complete cost-benefit analysis coupled with an environmental impact assessment before undertaking any expensive rainmaking exercise. Meanwhile, Kapila Jayasinghe, chief engineer of the state-owned utility, Ceylon Electricity Board, ruled out any long-term side effects from cloud triggering, citing a past attempt at artificial rainmaking in the 1980s. “The initial feasibility has been concluded and now it is about making a national plan and implementing it,” he said. 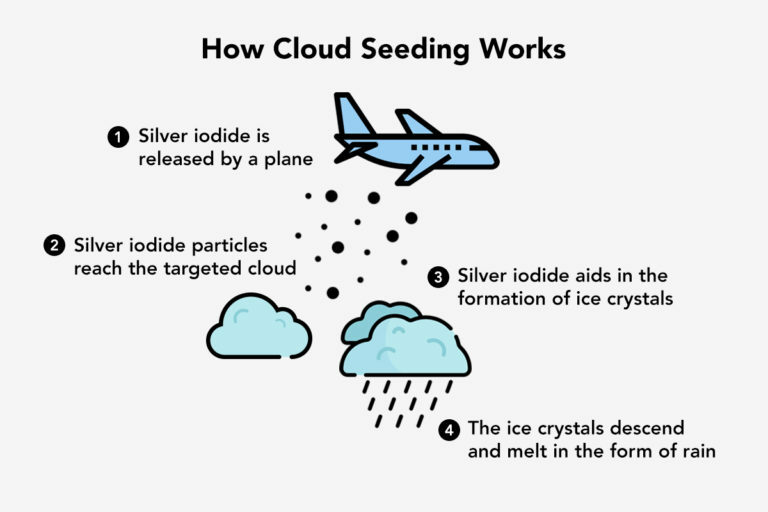 The process of cloud seeding involves spraying specific chemicals to induce rain. 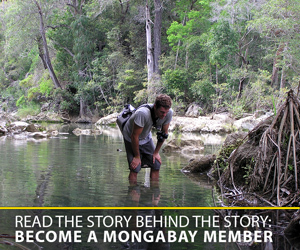 Graphic by Karthik Chandramouli/Mongabay. The rainmaking experiment took place March 22, with a Sri Lanka Air Force plane spraying chemicals onto clouds above the Maussakelle reservoir in Central province. The previous month, a team had been sent to study artificial rainmaking at Thailand’s Department of Royal Rainmaking and Agricultural Aviation, comprising officials from the Air Force, the CEB, and the departments of meteorology and irrigation. During the experiment, assisted by engineers from Thailand, the rainmakers expected an artificially created downpour over the catchment area later the same day. However, rainfall observed from satellites and in the nearby area of Norwood indicated that the rain occurred the following day, March 23. The Thai experts determined it was still possible to generate artificial rain in Sri Lanka, provided certain environmental conditions were met, top sources from the energy ministry told Mongabay. The source said the team working on the technology had been sent back to the drawing board to gather more atmospheric data before more experiments can be carried out. Meanwhile, Buddhi Marambe, professor of crop science at the Faculty of Agriculture at the University of Peradeniya and chairperson, national experts committee on climate adaptation said there should be sufficient checks and balances if rainmaking is to become a long-term program to address the island’s energy crisis. Marambe told Mongabay that it is important to further study rainmaking, if the country intends continuing with more experiments. “If the experiments continue, then certain types of chemicals commonly used for rainmaking, are likely to impact soil and plants. The process also creates cumulonimbus, known as ‘rain clouds.’ Triggering such clouds is expected to trigger high intensity rainfall. This could result in increasing rainfall in the catchment areas but likely to also result in severe soil erosion in the same areas due to the intensity,” he said. Banner image: Maskeliya reservoir, also known as Mausakelle, where a cloud seeding experiment was carried out on March 22, 2019. Image by Rehman Abubakr via Wikimedia Commons.